To return to the main story… – Art's Musings, etc. One of my main goals in this blog is to trace the path from shoe repair to biochemistry. I suppose it is mostly so that my kids feel free to explore and make their own stupid mistakes, but I also think that young people in general these days are way too constrained in worrying about jobs, careers, money, and success early in their lives. There are other ways of doing it, but the career counselors generally don’t always recommend them! Shoe repair at Tip Top leads to shoe repair/boot making at Square Deal leads to saddle making apprentice with Mr. Ginder leads to a great saddle making job at Cerrillos Saddlery in Santa Fe, NM. I’ll pick up the Cerrillos Saddlery thread in a post or two… Around Tip Top, Katherine entered my life and has been there ever since. In the middle of Square Deal and just before Ginder was my last attempt at St. John’s College, but the pull of houses in the woods and saddle making was stronger than great books. 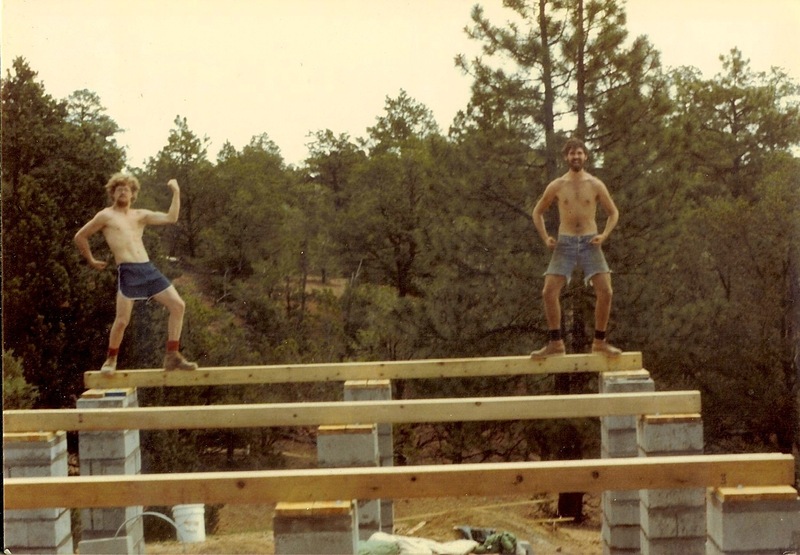 Lynn (left) and Art, proud of our new joists. 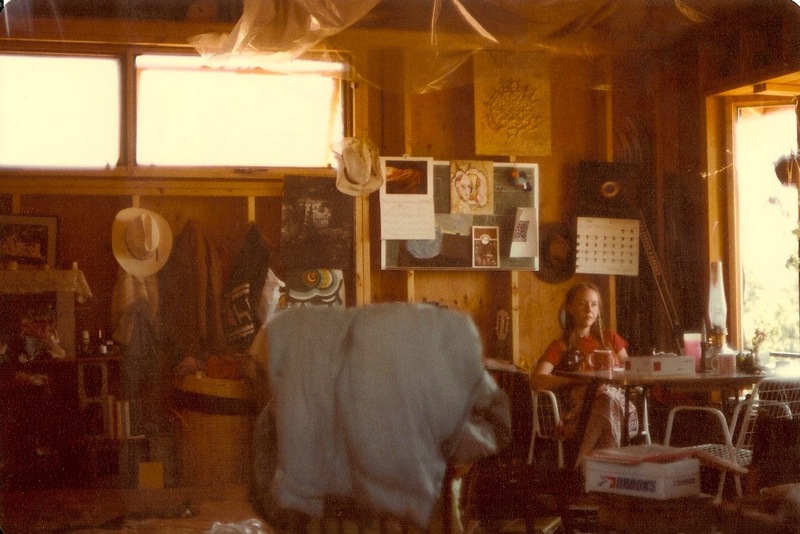 It was 1982, and Katherine and I got rid of most of our stuff and moved into a tent in the forest just outside of Santa Fe. Don’t ask me why, but it didn’t really even occur to us that we needed to deal with something a bit more permanent (like a house or even an outhouse) for several months. We were dreaming about how neat it would be to build different sorts of structures like solar adobes or straw bale house (our good friends did this). Looking back (with a father’s sense of dread), I can’t believe that we waited for months before we actually did anything. Even though it was New Mexico, we were living at 7800 ft, and there was a lot of snow and cold in the winter. Art contemplating the job. I now realize that I dress almost the same way for work today, minus the hat. Even the same Red Wing chukka's that I've loved since Tip Top days. Specifically, it was our wedding on Aug 5 that got the project started. We asked everyone for cash to buy lumber for the house. Gordy, my old hockey coach, was one of the few people who didn’t get the message, and he got us an electric “Fry Daddy”. Completely well-meaning, and we really did appreciate it, but we were vegetarians transitioning back into carnivorism (tofu just doesn’t do it on a fire in the woods) without electricity or water. 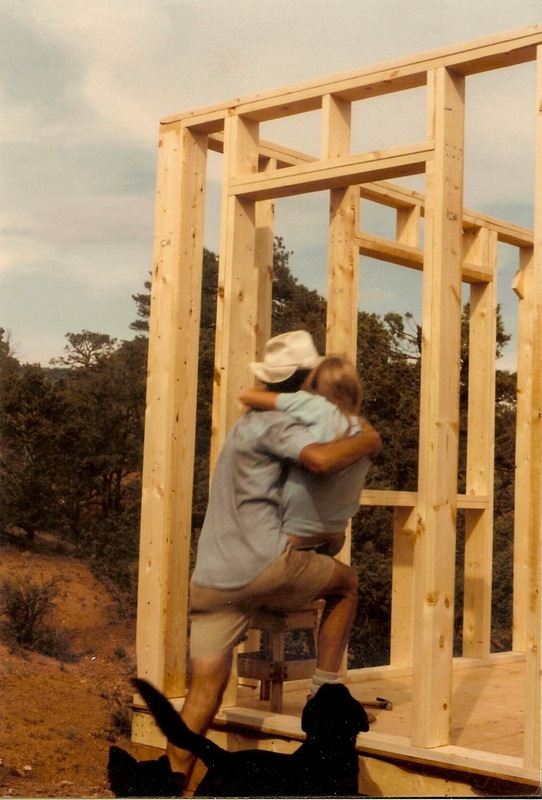 We got plans for a simple 16×24 foot frame house from our wonderful neighbors, Charles and Senta Hoge. We recruited a bunch of friends and family to visit us after our wedding, and with the $3-4k that we got from gifts, we built our house. 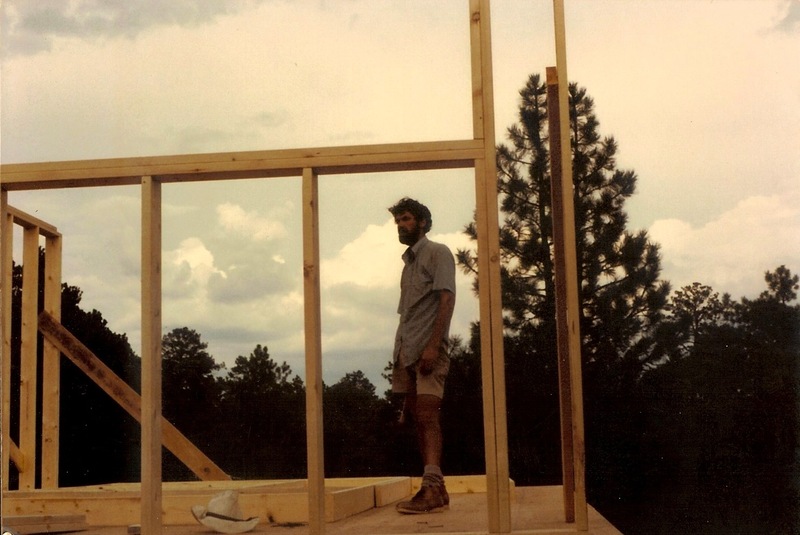 Current friends of mine at the University of Florida talk about “building their own house”, but with all due respect, they don’t know what they’re talking about. 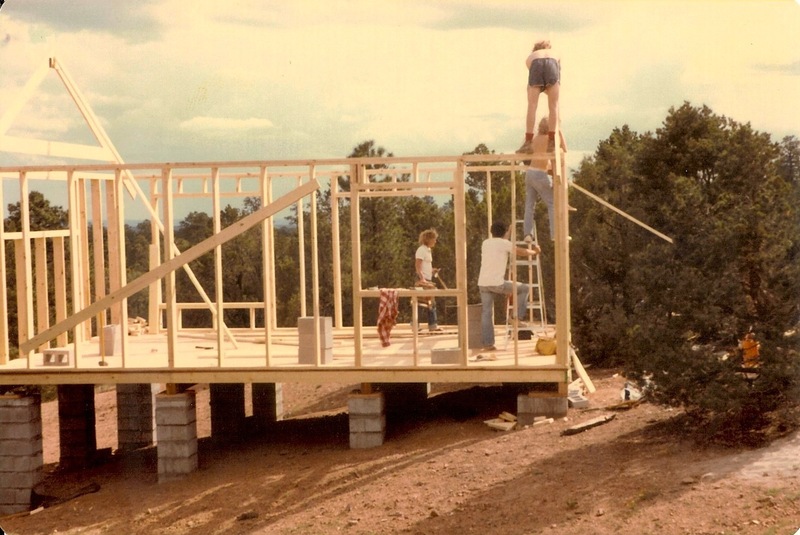 We built every inch of our house in Santa Fe without a power tool. Every piece of lumber and plywood was cut by hand. Every bit of concrete was mixed and poured by hand. I guess that is one reason that I still have a lot of patience for things like hand stitching leather. This was maybe a month after our wedding, and we finally had a threshold. We've always been sentimental! We managed to get most of a roof over our head before the first snow. We had a crack of about 5″ at the very top that we had not yet covered, when one morning we woke up dusted with a line of snow down the middle of the house. I would say that a generous term to describe our living conditions once the house was “complete” would be “quaint”. There are many more colorful terms that I will leave to the reader’s imagination. Suffice it to say that we cooked and heated with wood, had kerosine lamps for light (and a bit of heat), had a ceramic pitcher that held a few gallons of water for a faucet and a plastic wash tub for a sink. We took showers outside by pouring warmed water on top of each other with a pitcher. We listened to the radio on a boom box that was wired to the battery of our car. When we parked, we’d pop the hood of the car and hook up the alligator clips to listen to NPR. Katherine sitting by our bay window. The house looked pretty much like this the whole time (don't ask!). The whole thing was fun, romantic, naive, stupid, cold, dark, beautiful, sometimes scary, always an adventure. Our oldest daughter, Emily, grew up (in utero) in this house. We lived like this for 2-3 years until I got a new job on a ranch that I will describe later. We cooked by wood cook stove and used kerosene lamps. 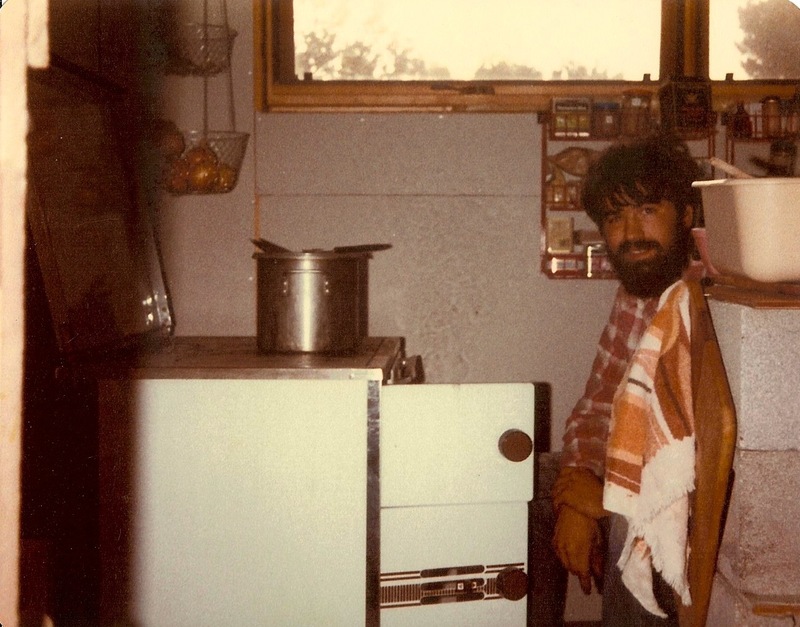 This was a FANTASTIC wood stove with oven. We still use the pot on top 30 years later.